It was a day which chilled one to the bone. The frost was thick on the rooftops and the thought of a hearty Sunday lunch was most enticing. Masterton’s research found The Rose, a gastropub with favourable reviews on the etherweb. Nestling just off the King’s Road in S.W. London and a free kick or two away from the Chelsea footballing ground. We arrived just after noon to an empty pub, save for the Manager seated at one of the tables who greeted us most cordially. The pub is decorated in light blue eggshell colour which gave it a light and airy feel. There was a large bar which is no doubt designed to handle the pre-football crowd which one assumes gathers here on match days. One chatted with the Manager on the subject of the glorious rugby match of the previous day. For the unenlightened out there, the England overwhelmed the famous All Blacks by 38 points to 21. Your Doctor was at Twickers to witness the event and it is a memory to treasure indeed! We ordered our lunches and then watched the pub fill with young, well-heeled Chelsea locals. It was a convivial atmosphere and our table was well placed, away from the hubbub with a view of the chilly exterior garden. The staff were very friendly and attentive and we were hopeful for good things to come. Starters arrived. One beheld a hearty plate full of chilli squid with chorizo. It was spicy and quite tasty, thought lacking in a certain piquancy but it is one of the Doctor’s favourite food combinations and so was a hit. Cook really should brush up her repertoire to incorporate such recipes. One must have a word with her. Fortescue’s soup was hot and he was therefore content. Masterton later admitted that his ham hock terrine was lacking in flavour. Dear readers, be warned, one finds that this is often the case with any terrine and in your Doctor’s humble opinion it is recommended to steer well clear of such starters. After the first course we were presented with a glass of prosecco each. They were “on the house” because we had booked our table on the etherweb. What a nice touch, however it might have been better to have them before the meal as we had already started on our second bottle of red. Main courses arrived. One’s large plate was positively brimming with assorted, scrumptious offerings. (See one’s daguerreotype and take note that this is a large plate). What one beheld was indeed “the works”. The plate with festooned with roast potatoes, broccoli, kale, an individually presented cauliflower cheese, baby roast parsnips, roast carrots and of course the obligatory large Yorkshire pudding. Oh! then there was the beef. This was all accompanied by a sauce boat of gravy and individual servings of home-made (one thinks) horseradish cream. The chef was obviously keen to please and this hearty assortment would satisfy the most voracious appetite. Masterton was presented with half a chicken and it was a very large portion indeed. The friendly manager came over and Masterton commented on the size of the chicken whereupon a challenge was offered that if Masterton could eat everything on his plate he would receive a free pudding. So you might think dear readers that all went perfectly but one thing was not right. 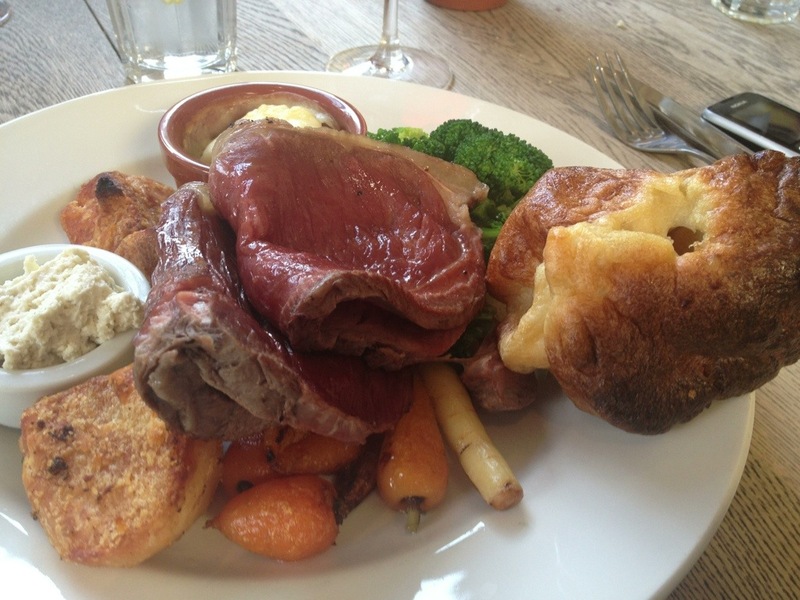 The presentation of the full Sunday roast was marred by the beef which shone like a red plastic toy and it looked…wrong. The other side of the beef was an anaemic grey. We discussed this strange appearance and agreed that maybe a broiler had been used to cook the meat in slabs. This was not at all what one expected. It certainly did not look like it had been carved from a joint. However, one pressed on. The meat was tender but The Inscrutable One who also had ordered the beef agreed that it was tasteless. Masterton failed to rise to the challenge of eating all on his plate despite a valiant attempt. However, he found his “dessert tummy” which he explained is separate to one’s main stomach. He ordered Bread and butter pudding but was disappointed by the soggy texture. Even the usually “contented with anything that resembles dessert” Fortescue also declared that it was fairly ordinary. What a shame. All was going so well and one cannot fault the welcoming and friendly team. So dear readers, why did your dear Doctor not complain about the beef? Surely this is not the norm for a man of such erudition. It is quite simple dear readers. Such was the welcome and it was obvious that the chef had tried so hard to produce a hearty Sunday lunch that we deigned not to ruin his or our day. However, the beef should never, ever have been served looking like a theatrical prop from a Tom and Jerry cartoon and one can only guess that there was a problem in the kitchen. Your Doctor and chums are happy to leave this eatery to the footballing fraternity for the time being but may return for a re-evaluation next year as there were signs of promise.